Find and plug the hidden electronic ears that are giving away your most valuable secrets. 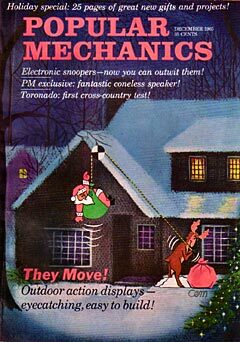 Here are the ways to make your home and office secure again By Larry Steckler (Popular Mechanics, December 1965) "I could bug your office while you're sitting behind your desk. A few seconds, the time it takes you to turn and answer your phone, and I could have a mike installed under your desk or behind a bookcase. Give me five minutes alone and I'll have your phone tapped too, but I can do that without even entering your office. "Shocking? Yes, but that's how easy it is to put your own ears into the most private business or personal conversations. Your car and home are just as easy to get at too. 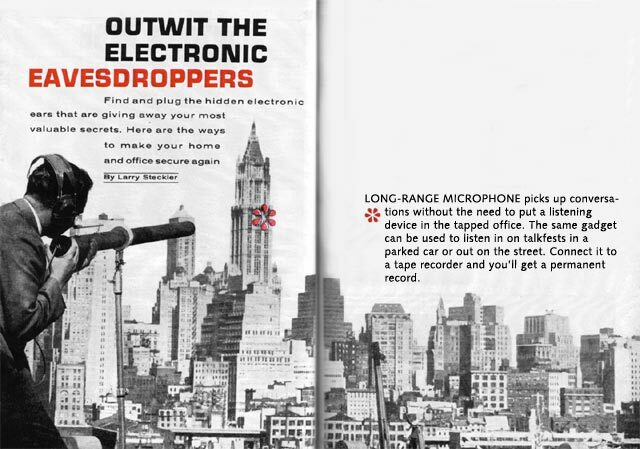 And long-range sensitive microphones can follow you through the park or out on the street. A microphone-carrying business acquaintance can make a record of luncheon conversations." These startling statements were made to me during my very first day of investigations into the art of debugging-the art of preventing someone from listening in on your secrets. I had been talking with Richard F. Sirchie, president of Criminal Research Products in Conshohocken, Pa., and before looking into debugging I was trying to learn a bit about the procedures and equipment used in bugging. Sirchie showed me some of the devices that are used for eavesdropping. He brought over a broom that had been standing in a corner of his office and stood it up on his desk. "Looks ordinary, doesn't it?" he remarked. "Dig though the straws and see what you can find." I did, and uncovered a miniature mass of electronics. "That's a short-ranged FM transmitter," Sirchie explained. "It has been picking up every word of our conversation and passing it on to a tape recorder in the next room. Come on, let's take a look." I followed him into the next room and watched as he rewound a tape recorder connected to an ordinary-looking FM radio. He pushed the playback button; there were our voices all over again. "That's only one example," he pointed out. "Take this little job," indicating a tiny metal box about 1 by 1 by 1 � inches. "Stick a piece of two-sided tape to one surface of this box and you can conceal it almost anywhere. Just press it into place and it stays. "The microphone is sensitive enough to pick up any normal voice within a 20-foot radius. The transmitter can relay that information up to a quarter-mile to a waiting receiver. And if you want to play it real safe, jack the receiver into a tape recorder that operates automatically whenever a voice comes through. You don't have to be there listening. Just pick up the tape once a day and run it through for a quick listen." My next stop was in lower Manhattan to meet Emanuel Mittleman. He's the Wireless Guitar Co. and works out of a small office in an old loft building. He also showed me how easy it is to bug an office or home. He even demonstrated how Goldfinger could have outwitted James Bond by using one of his (Mittleman's) gadgets. "Goldfinger used a radio disguised as a receiver to learn what cards were held by his opponent," Mittleman declared. "With my system there would be nothing visible. All you need are these two little metal discs (ordinary silver dimes with wire leads soldered to them) and this little receiver (a box about 2 by 3 by 1 inches). Space the discs about 2 inches apart, tape them to your arm, chest or leg and tuck the receiver anyway somewhere. "Now your accomplice radios Morse code numbers to identify the cards in your opponent's hand. You 'hear' these signals as little electric shocks through your skin. Care to try it?" I agreed. A few minutes later, I was wired for sound. Mittleman moved across the room with his transmitter and started sending. Each time he tapped the transmitter key, I received a minor jolt. It was easy to tell the dots from the dashes. I quivered longer when he sent a dash. "Now here's a tricky one," Mittleman continued, holding up a small black box that looked much like all the others I had already seen. "This one hooks up to a telephone. It is normally turned off. 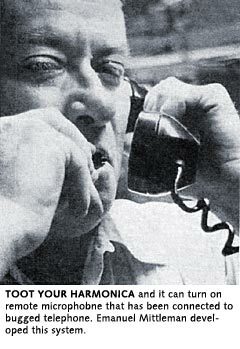 However, call the bugged phone and when the connection is complete, but before the phone rings, you blow a special tone on a harmonica into the phone you are calling from. This prevents the phone from ringing and turns on the bug. Now you can listen to everything in the called office. "Even better, you can complete a call to that office and after the party hangs up, blow the tone. Now your bug is on and again you can hear what is said about the call you just completed. "This works, no matter where you call from. The only requirement is that you call via direct dialing-it won't work if there's a live operator on the line." Next on the agenda was a range test of a little FM transmitter. Mittleman turned it on in his office. He also turned on a tape recorder and set it to play back a rather lengthy prerecorded reel of talk. Then he rigged his receiver, tuned it to proper frequency and invited me to take a walk. We wandered down the elevator, out of the building and all the way to the Battery, about a half mile. The signal was still coming through loud and clear. Mittleman pointed out, "Once one of these units is planted you can be almost anywhere in the neighborhood and listen in. There's little chance of being caught once the bug is placed. If it has been planted in a car, you don't even have to tail the car closely. If you miss a turn you'll notice the signal getting weaker, but because of the transmitter's range you still have time to do something about it." Other types of listening devices I uncovered were even more interesting. 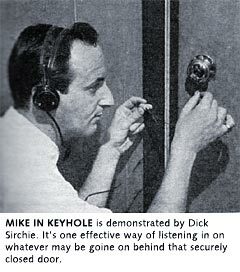 There are microphones for listening through walls, doors, pipes and keyholes. There's even a bug to fit the telephone mouthpiece. If you look at your phone and unscrew the mouthpiece, you'll find a microphone. It belongs there. Now turn the phone over and dump out the microphone. Notice clear plastic housing that the mike fits? To bug your phone, this housing is replace by a special unit with a built-in radio transmitter. If the inset in your phone is covered with electronic parts, it's been bugged. This method isn't used very often. It's usually easier to get at lines to the phone than to the phone itself. 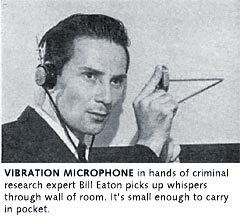 There are more exotic devices: microphones built into cufflinks, tiepins and wristwatches; radio transmitters built into a pack of cigarettes and, most fascinating of all, the martini olive transmitter. This is a very ordinary-looking martini. The olive is the transmitter and the toothpick poked into it is the antenna. Its range is quite limited, less than 30 feet, but enough to pass your lunchtime chatter with a buyer or other firm member to competition. 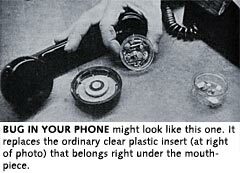 "In 1962, a House committee reported that at least 5000 phones in Federal offices in Washington were bugged-not by Russians, but by American bureaucrats spying on each other. Not long ago, an official of the San Francisco Telephone Co. estimated that 10,000 firms in northern California alone monitor the calls of their executive employees without the executive's knowledge." How do you protect yourself against bugging? The best way is to avoid saying anything you wouldn't want someone else to know. Naturally, this isn't very practical. So your next best procedure is to keep all business conversations private by conducting them in an area and over phone lines you know to be secure. The how-to-do-it is a lot more difficult than you might imagine. It is next to impossible to tell that your phone has been tapped by listening. A modern tap does not produce clicks, crackles or hollow sounds. They do not affect normal operation of your phone in any way. The only way to be certain that your phone is safe is to check the entire line before each call. Again this is not practical. The practical solution is to use "scramblers." These electronic devices fit the mouthpiece and earpiece of your phone. A matching unit is used by the party at the other end. The scrambler mixes up your conversation by changing tones according to a preset code. The matching unit decodes the scrambled signal. According to Richard Sirchie, "I start by looking for hidden radio transmitters with an electronic 'sniffer.' This is a wide-range field-strength meter. If it detects a radio transmitter it tells me. "To use it, I scan all walls, floor and ceiling of the room inch by inch. This check must be methodical. Low-power bugging transmitters are easy to miss. "Next I check for hidden microphones feeding a tape recorder. These devices can be hidden in walls, a nearby room or a lamp. All require wires to connect them to the recorder. To find the mikes, I use a 'whistler,' an electronic tone generator. I scout the conference room and nearby areas for wires. Every time I see a set of wires I connect the whistler to them. Then, leaving it connected, I go back to the room. 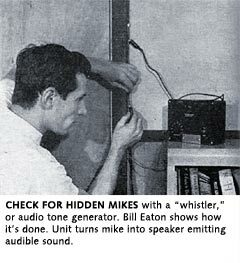 If a mike was connected to those wires it will now be emitting a high-pitched whistle. If I don't hear anything I know those wires are safe and go look for more. "After checking all wires in the area I can be reasonably certain it is safe. Now all I will worry about are bugs those attending the meeting may bring with them." Bugging and debugging can turn into a rather exciting game-the bugger trying to outwit the debugger and vice versa. There is only one important point to remember: Even the safest sanctuary can be bugged. To be certain of security you must check before each use of a conference room. Above all, beware of the public room or street. Check your office now. Odds are, if you hold a responsible position, one in ten that it's already bugged. Another important point. Once you've found a bug, don't assume you're safe. Chances are if someone has planted one, he's also protected himself by planting a second and possibly a third. I hope you never have occasion to play the game yourself, but if you do be sure to consult an expert-or you'll lose.